Lotería is the Spanish word for lottery. The game originated in Italy in the 15th century and was brought to in the mid 1700's. Lotería used to be a hobby of the upper classes, but eventually it became a tradition at Mexican fairs, markets, and festivals. The game of Lotería is similar to the game of bingo, but played with a deck of 54 cards with different images. Each tabla or board has a 4x4 grid of pictures with corresponding names and numbers. It's a really fun game to play. I remember loving it as a child. It was a good way for my parents to teach me Mexican nouns. Once you pick your "tabla" one person selects a random card from the deck and announces it to the players by its name. You can also say a riddle describing the picture instead of just naming the image. The chips used to mark off your spaces can be anything from small rocks to raw pinto beans. I remember using raw pinto beans to play this game as a kid Similar to bingo, the first person with 4 chips in a row (horizontal, vertical, or diagonal) and to call out "LOTERIA" wins the game. I recently bought a game and thought it would be a great way to teach my kids some Spanish words. However, I was a little surprised to see some of the cards in there were a little questionable. I ended up taking two of them out completely because I just didn't think it was appropriate for my kids. There's actually this guy I've been following on Instagram that just launched The Millennial Lotería. It's pretty amazing. He's taken the traditional cards and gave them a "millennial" makeover. It's hard to describe, you'll just have to check out his site. I can't wait to buy one for myself! I was in San Miguel last year when I happened to be in the main square as a wedding ceremony had ended and the Callejonada or wedding parade was starting. Being a wedding photographer, it was instinctual for me to pull out my camera and start shooting this fun part of the day (don't worry, I made sure to stay out of the actual photographers way). Mexican culture is so rich with traditions and celebrations. Weddings are a huge celebration where religious customs are highly regarded. The sacrament of marriage is a serious event, which is why so much thought is poured into a wedding day and the celebration is extended to include friends, family, and even the whole town. One tradition that is practiced in some Mexican weddings, especially colonial towns, is a wedding parade which happens following the ceremony. The couple comes out of the church followed by the bridal party and the wedding guests. 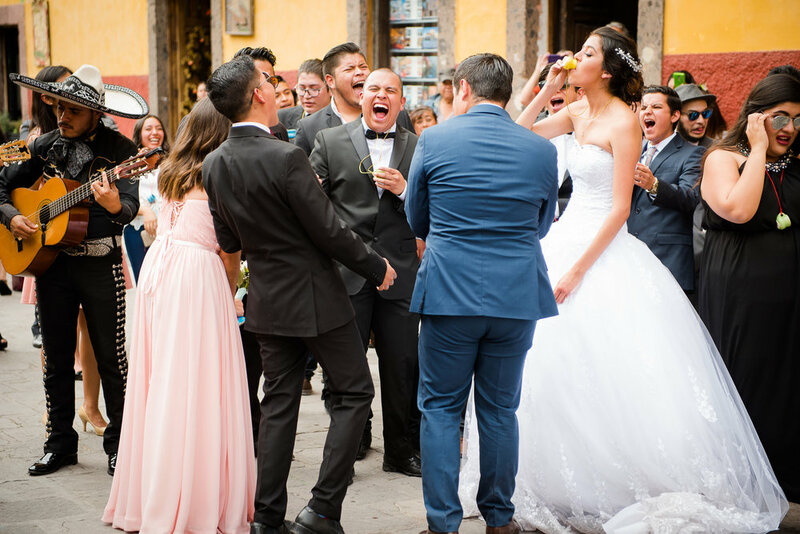 There's usually a mariachi band to accompany the procession, playing lively music so the guests can stop and dance along the way. Joining in on the walk is a donkey beautifully adorned carrying tequila to serve the wedding group. The wedding party walks with little shot glasses around their necks so they can enjoy tequila in celebration as they walk. This is like a pre-reception filled with lots of laughter, happiness, dancing and drinking. The Callejonada (wedding parade) is an amazing tradition where the whole town comes out of their homes to celebrate and have fun with the newly married couple as they head to the reception. I'm so glad I was at the right place at the right time to capture these shots.